On 5 July, the NDA government at the Centre partially declared the results of the Socio-Economic and Caste Census that was flagged off by the UPA regime. “Partially” meaning only the economic data was released, not the much-awaited caste figures. The demand for a caste census has been there for many years. The census will tell us how castes are placed on the socio-economic parameters and to what extent the impact of caste hierarchy persists – in literacy, education, their presence in the urban and rural population, their representation in the service sector and different occupations, and so on. The data will reveal the existing gap between different castes, whether, for example, the implementation of the Mandal commission’s recommendations in 1993 led to an increase in the employment of OBCs. It is in the context of Mandal commission that the caste system has been debated. The agitations for and against the implementation of the commission’s recommendations changed the course of Indian politics. It affected all political parties – both those in the right and the left. Even the Hindu nationalist organization, RSS, which was against reservations for OBCs, wasn’t spared. For the first time in its history, a non-Brahmin – Rajjubhayya, a Thakur – became its leader. V. P. Singh, the prime minister who initiated the implementation of Mandal’s recommendations, became the most cursed personality in the eyes of the upper castes. Ever since, the talk of caste has sparked controversies. Will the present BJP-led NDA government – given the BJP is the creation of the RSS and the RSS is the strongest protector and propagator of the caste hierarchy and was at the forefront of the anti-Mandal agitation in the 1980s – be allowed to declare caste data? It will depend on whether the demand to declare caste data gains momentum, on whether the parties in the opposition make an issue of the government’s reluctance. Mahatma Jotirao Phule was the social revolutionary who first spoke against the caste system and demanded reservation in government services proportionate to caste population. This meant, he said, reducing the lion’s share of government jobs in the hands of the Brahmins. He wrote about this in his famous book Shetkaryacha Asud (Cultivator’s Whip Cord, 1883). Shahu, the king of Kolhapur, introduced 50 per cent reservation in his state in 1902, inviting vehement opposition from the Brahmins, including the tall Congress leader B.G. Tilak, who, it is said, even threatened Shahu of dire consequences. The movement then spread to Madras State and Periyar took his cue from Phule. Besides, the British government introduced caste-based census from 1881 till 1931. That also opened the eyes of the lower-caste people, including the “untouchables”. The table (Literacy and Caste in Bombay State) shows how the Brahmin caste was way ahead in literacy compared to the OBCs and SCs (Mangs and Mahars are untouchables). The present situation will be clear only when the present government makes the caste census data public. Among the parties in the opposition, demand for publishing the caste data has been feeble except from the few with OBC leadership. Although the head of the present government claims to be an OBC and put the tag to good use during his election campaign, he has not done anything. Campaigning for the upcoming elections in Bihar, he has spoken against leaders who are for declaring caste data. In his speech in Gaya on 9 August, neither did he touch on the issue of caste, nor did he reject the demand of Lalu Prasad Yadav and Nitish Kumar. 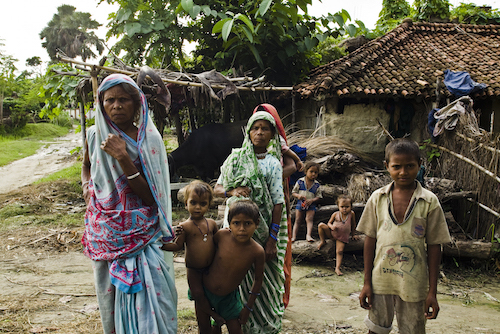 The Communist parties haven’t demanded caste data, because they ignore caste issues. These parties, in a way, were in agreement with the Congress and BJP in opposing the Mandal commission’s recommendations. RSS and all Hindu groups, and Brahmin sabhas were at the forefront of the opposition. Today, Dalits are not as vociferous as they were for the Mandal recommendations. Thus it appears that the burden of getting the government to declare the caste census data will be on the OBC parties and OBC organizations. If and when the data is made public, the onus will be on the same parties and organizations again to put pressure on the government to grant proportionate reservations in government services. How long it will take is uncertain, but there will be tremendous pressure on the government and even OBCs within the BJP will be restless. Gopinath Munde was a vocal supporter of the Mandal commission’s recommendations and the likes of Nitin Gadkari and Prakash Javadekar were in the RSS or the opposition camp or were scrupulously silent. It is also possible that caste organizations will become active again, demanding their quota in the services. I was actively involved in the Mandal movement of the 1980s and saw many caste organizations take shape to support the demand for the implementation of Mandal’s recommendations. This scenario is likely in the future when the data is made public. Therefore, the situation on the caste-census data calls for unity among the OBCs, including those belonging to non-Hindu communities. During Mandal agitations, Muslims and Christians too actively supported the demand to implement the recommendations. Their support will be key in the agitations of the future, too. Only published caste data will not solve the problem. The demand for proportionate share in government jobs will have to be raised by the deprived castes and communities. The 27 per cent quota for OBCs stands because of the Supreme Court judgments. This will have to be resolved by amendment of the Constitution. Otherwise, the caste-census data will not serve its purpose. The character of the governing class will not change. Twenty five per cent of the population will continue to grab 50 per cent of the posts. The upper castes occupy about 80 per cent of the higher posts. Dr Ambedkar wrote in “What Gandhi and Congress Have done to the Untouchables”, “That the Brahmins are the governing class is hardly open to question. There are two tests one could apply – first is the sentiments of the people and the second is the control of administration” (quoted from Dr Ambedkar on Congress and Brahmins, compiled by K. Veermani, The Dravidar Kazhgam Publications, 50, EVK Sampath Road, Madras, 1985). Even while hesitating to publish the caste-census data, the present government will be hoping against hope to do away with the disparities between castes. This will be a long-drawn process. But it will bring to the fore the basic contradiction in Indian society. The anti-caste struggle will gain momentum.